HTC is continuing to talk about its forthcoming smartwatch, and it's aiming to remedy the problems of many wearable devices already on the market face. HTC Chairwoman Cher Wang revealed in an interview with CNET that the company's smartwatch will focus on improving battery efficiency. Rather than operating on its own cellular radio it will, like many other smartwatches, tether to another device through Bluetooth. Wang also promised that HTC's offering will be more fashionable than many other wearable devices that lack a certain aesthetic appeal. Previously HTC CEO Peter Chou said the company was looking into building an Android-powered smartwatch with a built-in camera. 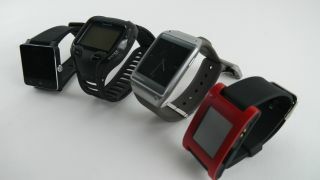 Wang recently revealed we can expect HTC's smartwatch by Christmas, and she repeated the launch time frame again today. In another revealing tidbit, Wang teased that HTC is looking into tablets as something we could see within the year as well. Earlier reports suggested that Google and HTC might team up to create a 7- or 10-inch Nexus slate. We've got our fingers crossed for an exciting future for HTC beyond the smartphones. At MWC 2014, HTC announced two new phones, the Desire 610 and Desire 816. These mid-range handsets are set to be joined soon by the HTC One 2, the successor to the HTC One on March 25. The year looks promising for HTC, especially as it looks to get into new product categories. We'll just have to wait and see if it can deliver. No pain, no gain; the Fitbit Force shows exactly what a wearable device gets right and wrong.